COLOR(S): Blue, black, liver, red, or wheaten. 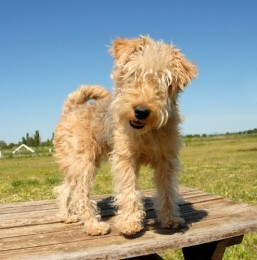 Wheaten or golden tan with a saddle of blue, black, liver or grizzle. Outstanding courage, determination, and bravery are part of the Fila’s characteristics. It is docile and obedient to its owners and family and extremely tolerant with children in its own family. Its faithfulness became a Brazilian proverb. The Fila Brasileiro makes a great family pet; it is always looking for the company of its master. It is gentle, loving, loyal and very protective. You don’t have to teach your Fila to protect you, as it does this on its own, it will protect you without hesitation. It is bold and very wary with strangers. At anywhere from 2 - 5 months of age you will notice that your Fila does not like strangers; this it is bred into it. The dog will only make up to people that it feels you trust. You cannot socialize a Fila to like people, you can obedience train it so that you are in control, but you cannot socialize it to like people. A Fila will attack a stranger, if has the proper temperament. This trait of the Fila is called "Ojeriza" translates to "Hatred and loathing of strangers". If you socialize your Fila at an early age by taking it around strangers it will be easier to handle it when strangers are present. If you choose not to socialize the dog you must be aware that no longer will the next door neighbor be able to just walk right in. It is an unsurpassed guardian of property; it is also inclined, by instinct, to hunt big game and to herd cattle. The Fila is NOT a breed for the average pet owner. It may drool, especially after getting a drink. Hip dysplasia and Bloat (gastric torsion; twisted stomach). Bloat is a health issue to most dogs, being the second largest killer of dogs other than cancer, but Fila Brasileiros can be particularly susceptible to it because of their deep chests. They need firm training and handling to control their aggression. Proper socialization and obedience training should begin at an early age.